A new study conducted by researchers at the Columbia University Medical Centre has found that shellfish population suffers from contagious cancers which are similar to leukemia. It also suggests that direct transmission of cancer among some marine animals may be more common than thought. The study titled “Widespread transmission of independent cancer lineages within multiple bivalve species” was released online in the journal Nature. Natural transmission of cancer cells from one individual to another has been observed in two cases, Tasmanian devils and certain breeds of dogs. 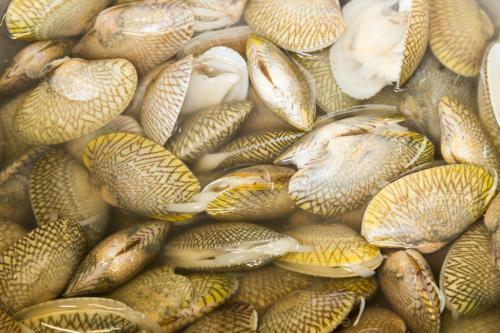 Last year, Stephen Goff from Columbia University Medical Center discovered a third example of transmissible cancer, in soft shell clams living off the Atlantic coast. Goff and his colleagues examined the DNA of tumour cells from mussels, cockles, and golden carpet shell clams collected from the coasts of Canada and Spain. The cancer, known as disseminated neoplasia, is a leukemia-like disease that affects bivalves (a marine invertebrate). This condition leads to many large, abnormal cells in the circulatory system. Carried by sea water, the cancer cells are being transmitted among members of the same species and from one species to another. “These invading cells seem to be the most frequent causes of these leukemia-like cancers in mollusks," said study senior author Stephen Goff. Normally, cancer cells have the same DNA as their host, and both the cells and the host eventually die together. But the analysis of these cases revealed that the genetic makeup of these cancer cells did not match those of their hosts. Instead, the cells came from other animals. The researchers determined that it was the same line of cancerous cells that was spreading like a virus and infecting numerous shellfish. In mussels and cockles, the cancer lineages are derived from their respective host species. Further, the infectious cancer cells found in the carpet shell clam were traced back to a completely different species. It did not match with any member of its species, but instead matched the pullet shell clam, where they likely originated. It is believed that the cancer cells enter seawater via the excrement of their original hosts and then invade the digestive or respiratory tracts of new victims. The researchers concluded that this cancer was due to a highly unusual case of cross-species transmission. These findings show that transmission of cancer cells in the marine environment is common. "I think the most surprising aspect is the realisation that these infectious clones spreading between individual animals in the oceans are indeed very common," Goff said. "It awakens us to the fact that animals living in the sea are really in a shared environment—that viruses, bacteria and even cells are freely circulating between individuals." Future research can investigate whether human cancers cells spread from one individual to another. "Now that we have observed the spread of cancer among several marine species, our future research will investigate the mutations that are responsible for these cancer cell transmissions," said Goff.